I recently make this recipe with our kids cooking class. The kids really loved it, and got to work on their knife skills as they chopped all the ingredients. This is a perfect recipe when melons are in season. I served this with tortilla chips and cassava chips (made from a root also known as “yuca”). 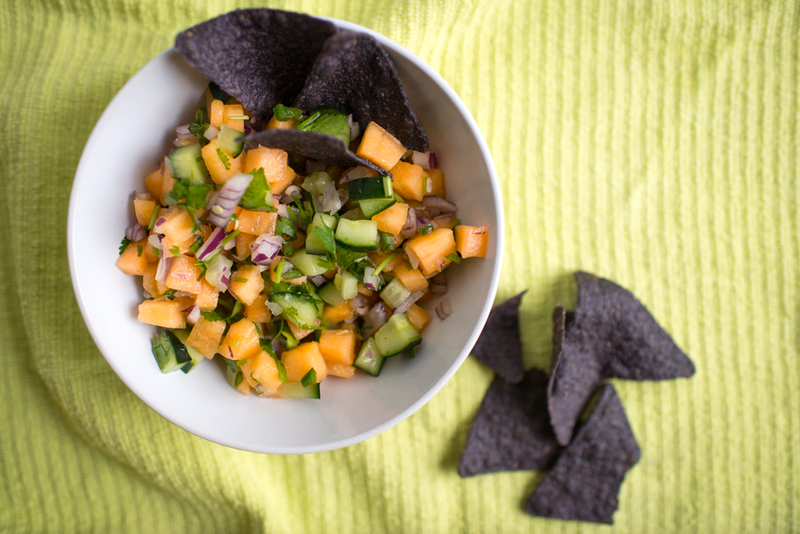 Blue corn tortillas work well with this salsa and look really pretty against the orange melon. Salsa is a great way to get in some veggies (or fruit, in this case) and is a healthier choice than a creamy or cheesy dip. Careful with the jalepeño; add sparingly at first until you achieve the right amount of spiciness. Consider serving your youngest eaters their portions before adding the jalapeño pepper. This also works great on top of fish like tilapia or salmon for a fresh summer taste. Mix all ingredients together gently in a medium bowl. Serve immediately or chill for up to 1-2 days. Serve with your favorite chips.  “Super Yum. This salsa is SOOO good.” —Zane, age 9.  “Whoa, this is really good.” —Dane, age 9.